Here is a tutorial for DIY Fringe Earrings to go with your DIY Fringe Necklace. Can you tell I am just a wee bit into the fringe trend? P.S. I have been on a style kick as of late, but I've got some really great home decor DIYs that I can't wait to show you soon! For now here is how to make these spiffy earrings. And yes, they are a part of the Leather Couch Chronicles. 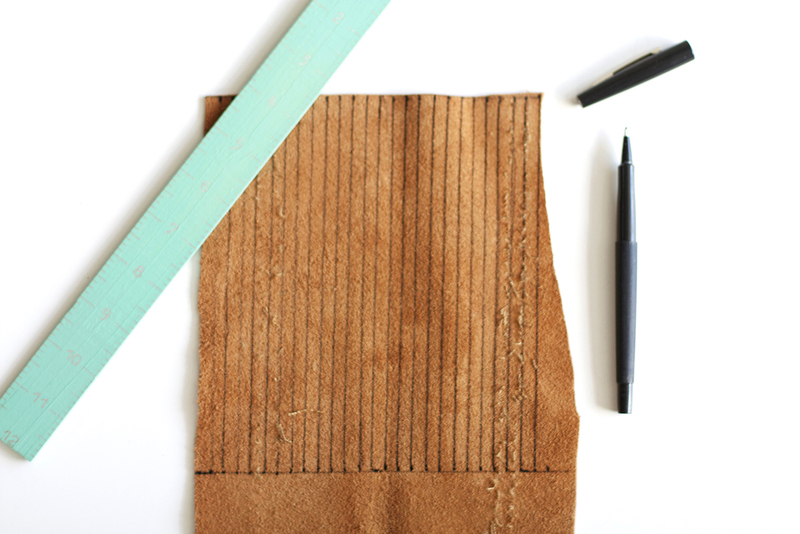 Using a ruler + pen, measure out 1/2" x 3 1/2" strips of leather. I used 5 pieces for each earring. An odd number of strips is good, so you can have one piece that hangs in the center. Glue one end of each strip around the earrings. And you're done! What do you think?! If you are curious about the collar in these photos, check out my DIY Peter Pan Collar post. Also, here is Leather Couch Chronicles #10, and here all of the posts in the Leather Couch Chronicles. If you find this post helpful, I'd love it if you subscribe below. Subscribers get exclusive DIYs and a free party printable set just for signing up!